Experience a taste of the northern wilderness when you display this decorative big buck knife in your home or at the office! 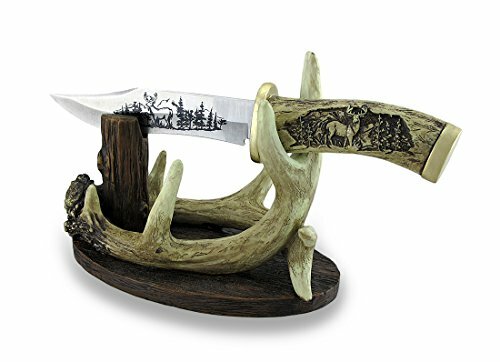 Made from cold cast resin with a hand-painted aged bone finish, it features stunning images of a big buck standing in the trees on the unsharpened metal blade, and carved into the bone handle. This display knife even has its own tree stand! It rests in a stand made of a set of stylized deer antlers and an old tree trunk, and measures 10.5 in (27 cm) long, 6 in (15 cm) tall and 4 in (10 cm) wide with the knife attached. It makes a glorious gift any true sportsman would be proud to display! If you have any questions about this product by Zeckos, contact us by completing and submitting the form below. If you are looking for a specif part number, please include it with your message.